BlackBerry KEY2 unveiled with 4.5-inch touch display, Dual cameras, 6GB RAM and Physical QWERTY keyboard. 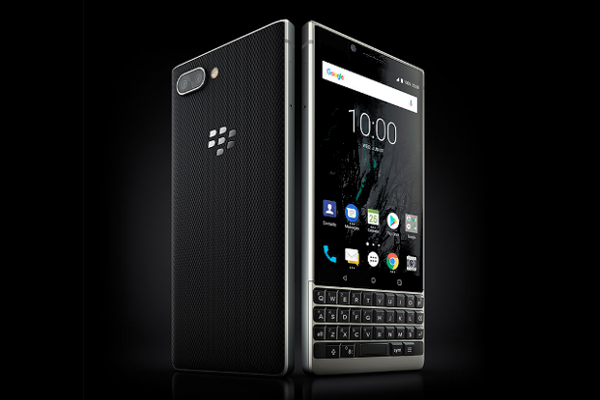 TCL Communication, a leading smartphone manufacturer and BlackBerry-brand licensing partner, today announced the launch of BlackBerry KEY2 featuring an iconic BlackBerry physical keyboard. This all-new BlackBerry smartphone packs a number of features that are firsts for any BlackBerry smartphone. Running the latest Android 8.1 Oreo operating system, the BlackBerry KEY2 is the first ever BlackBerry smartphone to feature a dual-rear camera. It also includes the introduction of Speed Key, a universal shortcut key that now makes it possible to instantly access the apps, contacts and functions you use most from anywhere on your device at any time. BlackBerry KEY2 has a redesigned intelligent keyboard as well as a 4.5-inch touch display that includes 2.5D Corning Gorilla Glass which offers increased scratch resistance and creates a more seamless design and edge to edge look. It also includes in-keyboard fingerprint with updated mechanics for an improved tactile response and a more convenient user experience. The BlackBerry KEY2 operates on Android 8.1 Oreo operating system and also has the enhanced Convenience Key, making it easier to access your most-used apps with custom profiles for at home, in the car, in a meeting or on the go. Powered by a Qualcomm Snapdragon 660 processor, the BlackBerry KEY2 offers 6GB of memory in both 64GB and 128GB storage variants - with both offering expandable storage MicroSD support, making this the most advanced BlackBerry smartphone ever. In addition to Qualcomm Quick Charge 3.0 and the BlackBerry KEY2 adds a new Smart Battery Experience that will learn from your daily charging habits and recommend when to charge up so you have enough battery life to make it through that next meeting, flight or event. The BlackBerry KEY2 also features a more impressive BlackBerry camera experience with the introduction of the first dual-rear camera on a BlackBerry smartphone. These dual 12MP cameras bring an improvement in auto white balance, faster auto focus, improved image stabilization and new photo capture experiences never before available on a BlackBerry smartphone. The BlackBerry KEY2 also introduces new capture modes, like Portrait Mode and Optical Superzoom. BlackBerry KEY2 also integrates Google Lens, so now you can more quickly and easily search and get more information on things like book reviews simply by capturing a picture of the book's cover, get landmark details and much more. There is a new key added to the BlackBerry keyboard with the addition of Speed Key, enabling shortcut access to a number of functions on the device at any time. No longer do you have to return to the home screen of your smartphone or search in an app folder to access the apps, contacts and functions you use and communicate with most. Just press Speed Key along with any of your customizable 52 shortcuts to instantly access your frequently used apps, call a favorite contact, or access other immediate functions; saving valuable little moments throughout the day. This all-new BlackBerry smartphone continues the KEY series keyboard legacy of supporting flick typing for faster messaging using predictive text that learns as you type as well as acting as a trackpad to quickly scroll through emails, web pages and more for a more intuitive mobile reading and browsing experience. Like all BlackBerry smartphones, the BlackBerry KEY2 includes enhanced security and privacy features right from the start. From a hardened operating system to BlackBerry's proprietary technique for establishing a hardware root of trust adding security keys to the processor, the BlackBerry KEY2 is the most secure Android smartphone. It comes pre-loaded with DTEK by BlackBerry application that removes the complexity of security by providing an 'at a glance' security meter. The DTEK by BlackBerry app now includes the new Proactive Health check feature, which enables you to scan your device and receive instant feedback on potential vulnerabilities and security optimizations. Locker has also been improved to offer even greater personal privacy and control over your content. With features like private folders for documents and photos so they don't get uploaded to the cloud. NFC: Features on KEYone that use NFC technology include Android Beam, Tap and Pay, and Tap and Go. The BlackBerry KEY2 will begin shipping globally beginning this month with the suggested retail price starting at $649 USD / €649 EUR / £579 GBP / $829 CAD.